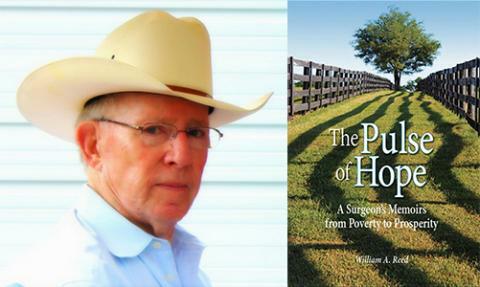 DR. WILLIAM REED, GROUND-BREAKING OPEN HEART SURGEON, SPEAKS AT BOOK CLUB MEETING THIS WEEK! Just a reminder: Dr. William A. Reed with be present at the next All Good Books discussion group meeting this Thursday, May 14, 2015 at the Community of Christ church (7842 Mission Road, Prairie Village, KS) at 7 PM. We will meet in the Church Library. Along the way the reader meets a passionate horseman, philanthropist, husband, father and poet. The final chapters in the book also speak to issues of faith, doubt, fear and leadership. You have the opportunity to hear him speak and ask questions on Thursday evening. We hope you can join us. In preparation for the meeting, here are some questions that might stimulate your reflection on the book (and if you haven’t read the book, come anyway)! On page 25 of Dr. Reed’s autobiography, he mentions Hudson’s Secret Journal. Have you read the book? Either way, do you agree with your understanding of its philosophy? On page 40 Dr. Reed discusses his wife’s childhood, her parent’s (Asay and Pauline) expectations, and their approach to parenting. How does their parenting compare to your own experiences as a child or young adult? What does the phrase “damned by faint praise” mean? Have you heard that phrase before or experienced that kind of praise? On page 59, Dr. Reed talks about “the silent treatment.” Have you experienced the silent treatment from someone in your life or used it as a tool in a disagreement? What were the results? An incident recorded on page 65, describes how Dr. Reed challenges the head of the cardiovascular department at KUMC to not “close” after heart surgery but to redo a stitch so a 6-year-old girl’s heart would not develop scarring. If your career depended on contradicting or correcting a superior, could you do it? Of all the surgical stories in the autobiography, which is your favorite? Which did you find most emotional or heart-rending? Which did you find most inspirational? Who do you think was the VIP patient mentioned on page 81? Reed places a great deal of emphasis on “good mentoring” (pages 112, 114). Have you ever experienced a “good mentor” as described by the Doctor? The concept of a “unique calling” for medicine is discussed on pages 114-115. Do you believe that any of the five “opportunities” listed on page 114 apply to other fields of endeavor? On page 116 in a discussion of mentoring, Dr. Reed talks about seeing people at their most vulnerable time. Do you see any parallels to your career or avocation? On page 122, Dr. Reed discusses “the secret of success is constancy of purpose” (Benjamin Disraeli). What is your reaction to his message on career choice? Does it apply to you? Reed explains that a good racehorse must excel while “mud and dirt and sand” are being thrown in the horse’s face (page 130). Is there a parallel in human endeavor? The author talks about the difference between horses that have an attitude and those that are mean (page 150). Do you think the same applies to pets? To humans? On pages 186-189, Dr. Reed explains his approach to leadership. Do you support his view? Do you see inherent problems with servant leadership? Have you ever worked for anyone who subscribed to this leadership style? On page 216, Dr. Reed says, “Every man dies alone with his God.” What does that sentiment mean to you? Do you understand the doubts and questions expressed on pages 216-218? Do you believe that faith can grow through doubt? Do you have answers for the questions posed in Dr. Reed’s poem on page 219? In the final chapter, “Poet and Philosopher,” the author becomes very philosophical and poetic as he discusses life span, living in harmony with your values, faith and pain, and the search for meaning and hope. What are your thoughts on the final chapter?